Judges Tom Coleman, Michael Davis, Dennis Bailey and Tim Bailey pose at the annual Red Mass of the St. Thomas More Society for South Florida, May 15 at St. Anthony Church in Fort Lauderdale. FORT LAUDERDALE | While acknowledging that the U.S Founding Fathers “got it right” in setting up a limited government, Archbishop Thomas Wenski told Broward-area lawyers and judges there is no shame in seeking prayerful guidance for their legal vocations. Jamie Finizio Bascombe proclaims the first reading at the annual Red Mass of the St. Thomas More Society of South Florida, held May 15 at St. Anthony Church in Fort Lauderdale. The archbishop told the gathering that, from the nation’s beginning, the participation of God-fearing people in the formulation of our nation’s laws and policies was welcomed and encouraged. The Florida Catholic Conference and the United States Conference of Catholic Bishops regularly engage in public policy issues and attempt to shape legislation that promotes the common good and protects the poor and the most vulnerable, he noted. “No one should have to apologize for being a Catholic in America today. And no one should question our contributions as citizens to our country. And no one should think that he or she has to abandon faithfulness to Catholic teachings as a price to enter into the public square,” the archbishop said. 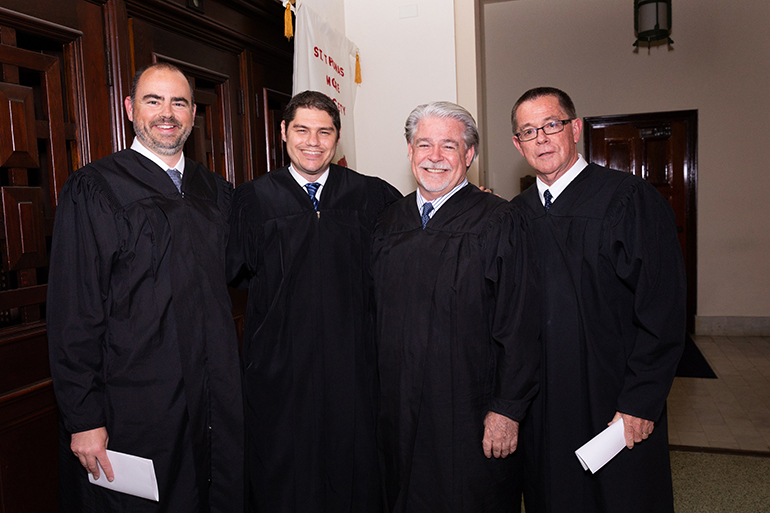 From left: attorney Gary Iscoe, Judge Michael Allen Usan, and attorneys Leo Levenson and Robert Gonzalez pose at the annual Red Mass of the St. Thomas More Society for South Florida. 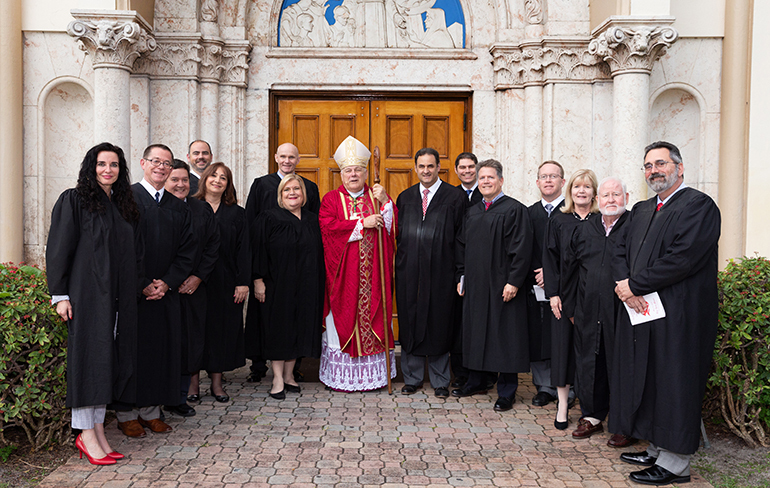 Founded in 1989, the St. Thomas More Society of South Florida is a Catholic association of South Florida’s legal community — including lawyers, judges, public officials and other law professionals — dedicated to the advancement of the principles of St. Thomas More. 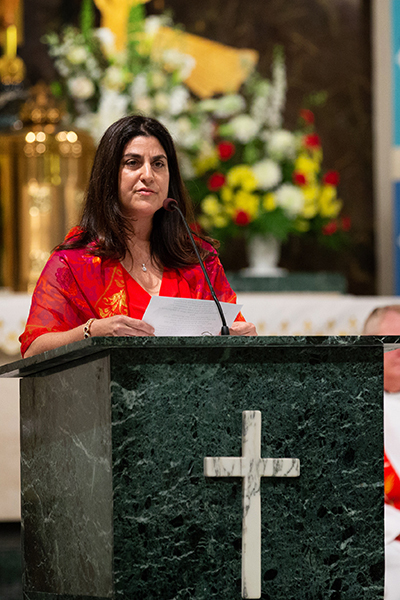 During her introduction of the keynote speaker at the annual dinner that followed the Mass in Fort Lauderdale, attorney and society member Jamie Finizio Bascombe noted the presence of lawyers of Catholic, Jewish and other backgrounds — all united in respect for a faith-rooted understanding of justice. In his keynote remarks, Herman Russomanno of Miami, past president of the Florida Bar, said he first wished to congratulate all the members of the society on their commitment to follow the moral principles of St. Thomas More. Russomanno then reflected on the life of Thomas More himself, noting that the saint’s father was a judge. Russomanno noted the cardinal virtues that St. Thomas More might say define the personality of a judge: independence, courtesy, dignity, open-mindedness, impartiality, thoroughness and decisiveness, an understanding heart and social consciousness. 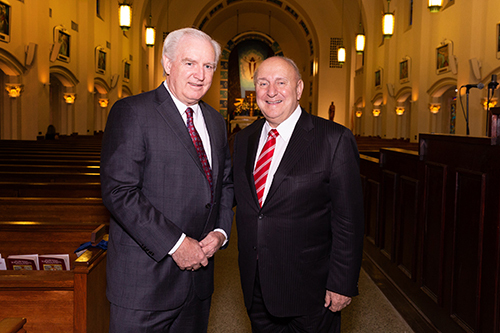 Robert Bulfin, immediate past president of the St. Thomas More Society of South Florida, poses with Herman Russomanno of Miami, past president of the Florida Bar, at the annual Red Mass of the St. Thomas More Society for South Florida, May 15 at St. Anthony Church in Fort Lauderdale. “Through his lifetime he worked hard to see that the poor were protected against injustice — something we lawyers have an obligation to do. There should be no people in this country who don’t have legal advice or representation because they can’t afford it,” said Russomanno, who imagined the saint asking modern-day lawyers questions about their faith and good deeds. “Are you a caring person, a loving person who instills godly values to your family and friends? Do you love to help other people? Are you someone who, when you climb the ladder of success to someday be with Our Heavenly Father, do you, as you climb that ladder, reach out with your dominant arm and help others up?” Russomanno asked rhetorically. 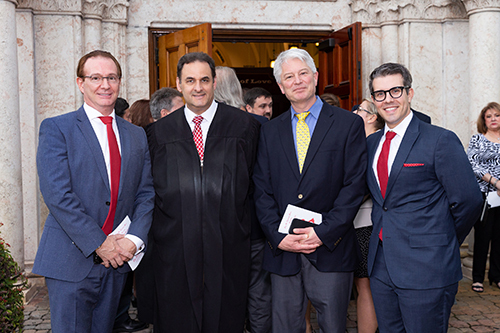 Russomanno received the 2015 “Lex Christi, Lex Amoris” award from the Miami Catholic Lawyers Guild. His long list of accomplishments includes being president of the Florida Bar in 2000 and president of the Miami-Dade County Bar in 1993-94. He was named 2001 Florida Trial Lawyer of the Year and is one of the top trial lawyers in the country. Russomanno attended the event with his wife, Sally, whom he met 50 years ago when they were both teenagers in their native New Jersey. Both attended Catholic schools and he said, for him, it was love at first sight. Sally has taught religious education and pre-school at their home parish, St. Louis in Pinecrest. Herman Russomanno has served as an adjunct professor teaching trial advocacy at St. Thomas University School of Law. He also has chaired STU’s law school board of advisors. He graduated from Rutgers University in 1971 then obtained his law degree from the Cumberland School of Law at Samford University in Birmingham, Ala.
Past speakers at the St. Thomas More Society event, he noted, included four university presidents, a past Florida governor, a U.S. Senator, a cardinal, three federal appellate judges and U.S. Supreme Court justices Clarence Thomas and the late Antonin Scalia. Miami Archbishop Thomas Wenski poses for a picture with local judges following the annual Red Mass of the St. Thomas More Society of South Florida, held at St. Anthony Church in Fort Lauderdale May 15.